Mike Smith wearing Drexler cap with pins from locations of all 21 reunions that he attended. Mike's grandfather, Delmar Baily, was killed in action when two kamikaze planes hit and sunk the destroyer Drexler on May 28, 1945. The destroyer Drexler (DD-741) sank on May 28, 1945, after being struck by two kamikaze planes. In 1985, 40 years after tragedy struck, several of the 199 survivors and some family members of the 158 men who died in the sinking got together for their first reunion in Charleston, South Carolina. The group has gathered together for 21 straight years of reunions in different cities around the US. However, Gene Brick, the Drexler survivor who had coordinated each annual reunion, indicated that 2006 would be his last year in this role. He had reached his 80s and no longer had the energy to continue coordinating the numerous tasks required to hold an annual reunion. 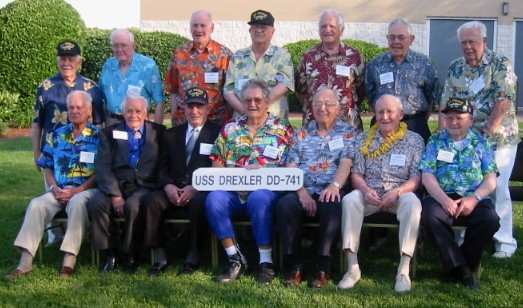 About 100 people, including 14 Drexler survivors, attended the 2006 reunion at the Doubletree Hotel in Virginia Beach, Virginia, from May 18 to 21. Many wondered whether the Drexler Survivors Reunion Association would survive. The business meeting to discuss the fate of the organization took place during the morning of May 20, Saturday. No one, either from the 14 survivors or from the other family members, wanted the reunions to stop. Gerry Lewis, who lost his father as a young child when Drexler sank, spoke about how much the reunions meant to him and his sister. He felt that meeting together regularly had helped the healing process related to the tragedy. 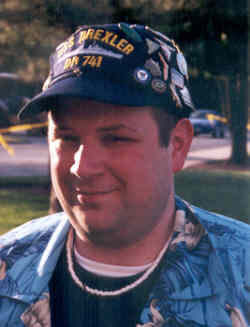 The father of Tim Clemens survived the sinking but passed away in 2001. Tim explained, "My father never really talked about his wartime service until these reunions." Although members of the two generations younger than the Drexler survivors wanted to continue, Gene Brick explained that organizing the reunion and handling the related correspondence required real commitment to ensure everything got done. The younger people asked the survivors and their wives to leave the room for a short time so that they could discuss the best way to organize. After some debate, the group agreed that Sandy Cleveland, a friend of Drexler survivor Fred Mitchell, would take over Gene's responsibilities for coordinating the reunion. They decided that Philadelphia would be the best place for the 2007 reunion since several association members lived in the area and could more easily support the tasks required to organize the event. The Drexler survivors and their wives then returned to the hotel meeting room to hear what had been discussed. They supported the recommendations, and the current leaders of the organization agreed to continue on in an advisory capacity to ensure a smooth transition to the younger generations. Lucinda Smith's father, Delmar Baily, was killed in action during the kamikaze attacks on Drexler. Lucinda volunteered at the meeting to take the important job of archivist in order to ensure proper safekeeping of all records related to Drexler and to transport them to each reunion. Gene Brick explained the reason for his many years of service to the Drexler Survivors Reunion Association, "I did it for love of the outfit and for my shipmates who got killed." Everyone present agreed with the proposal for the association to give him a new television set for more than two decades of devoted service. During the morning of Friday, May 19, a memorial service was held on the deck of the battleship USS Wisconsin (BB-64) in Norfolk to remember the 158 Drexler men killed in action. 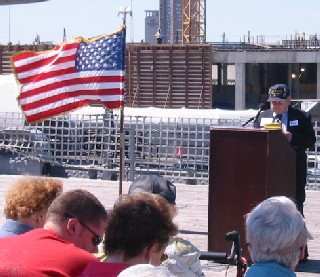 Several survivors went to the microphone in front to read off the names of the men who lost their lives on May 28, 1945, when Drexler sank in less than a minute after a second kamikaze plane struck the destroyer. The ceremony also included a touching rendition of Taps, the placement of a memorial wreath, and a color guard from Little Creek Naval Amphibious Base in Norfolk. Michael G. Hlywiak, former commander of USS Boxer (LHD-4), where the Drexler Survivors Reunion Association had its 2002 memorial service off the coast of San Diego, came down from the Pentagon to attend the ceremony in Norfolk. Memorial service attendees had the opportunity to tour the Nauticus National Maritime Center before and after the ceremony and then visit the General Douglas MacArthur Memorial in the afternoon after lunch at the Nauticus cafeteria. The reunion schedule left plenty of time to relax in the hospitality room set up at the hotel or to see the sights of Virginia Beach. The hospitality room had many historical items related to Drexler, plus items for the Saturday night raffle were displayed so visitors could use tickets to designate items they hoped to win. Gene Brick, his brother Sam, and his son Bartt warmly greeted people and answered any questions. 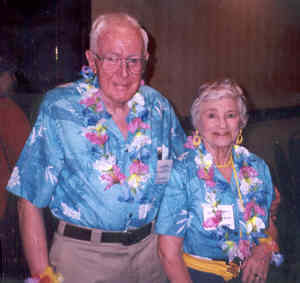 The reunion attendees dressed up in their Hawaiian clothes for the Saturday evening banquet. A professional photographer came before the banquet to take group photos of the 14 survivors and all the reunion attendees. After everyone finished eating, there was an individual drawing for each raffle item. Due to the large number of items donated to help fund the organization, the raffle drawings went on all the way to 11 p.m. On the way out, the sleepy people still remaining discussed the need to shorten the raffle time in future reunions. Before the 2006 Drexler reunion, my wife Noriko and I had never attended a memorial service or reunion for American servicemen who fought in World War II. We discovered that many persons who attended the reunion had fascinating stories about the war and the reunion association. On Friday night we went to dinner with Lloyd "Red" Brantley and his wife Shellie Hudson, who met each other at a high school class reunion in 1987 and married soon after. We were very surprised to find out that he survived the sinking of two destroyers during World War II. The two have attended the annual reunions for each destroyer for the last 17 years. Before joining Drexler's crew, Red Brantley served aboard the destroyer USS Corry (DD-463) as a radioman. Corry escorted warships and transports during the D-Day invasion of Utah Beach in Normandy on June 6, 1944. While shelling the shore, the destroyer sank at 6:30 a.m. after she hit a mine and was struck by heavy-caliber shells from a shore battery. Red wore a life belt when he jumped overboard, but he swam in the cold waters of the English Channel for three hours before being rescued by another destroyer. However, 24 of Red's crewmates died that day. Later in 1944, Red and four other Corry crewmates joined Drexler's crew, who were on their way to battle in the Pacific. Red explained to us while eating dinner that he never went below deck once Drexler reached Okinawa since he was afraid of the ship sinking. "I used a life preserver as a pillow when I slept on the steel deck." When the second kamikaze plane hit the destroyer on May 28, 1945, Red received multiple shrapnel wounds and went quickly into the water without a life preserver. He avoided the oil fires on the water, and a crewmember with a life preserver told Red to hang on to him. Although Red had been wounded, he did not panic since he felt much more comfortable in the warm waters off Okinawa than the cold English Channel. After a little less than an hour in the water, he was picked up by a support ship and then transferred to medical facilities on the attack transport USS Crescent City (APA-21) to be taken to the naval hospital on Guam. A psychologist talked with Red when he returned to the States to see if he wanted to go back to sea, but he responded that he had experienced enough. He remained with the Navy on the mainland until his discharge in October 1945. Looking back on his wartime experiences, Red said, "I'm now 84 years old and feel blessed to be here. I believe that I survived for a purpose." Risa Morimoto, a New York City filmmaker finishing a documentary entitled Wings of Defeat (Tokko in Japanese), visited for the first two days of the reunion to interview Drexler survivors and film the Drexler memorial service on the battleship Wisconsin. On Thursday night, she did three interviews with two survivors in each interview. I had the wonderful opportunity to sit in on the first two interviews as they were being filmed. Risa first interviewed Henry Christiansen, Fire Controlman aboard Drexler, and Gene Brick, Gunner's Mate. The first kamikaze plane crash completely destroyed Henry's gun mount, and he thought at the time that he was the only survivor from that gun mount. He spent about 45 minutes in the water until being picked up, but Japanese planes continued strafing at times. He was in shock, not angry, after being rescued, but when he returned to the States he stayed mad at the Japanese for quite a few years. He now holds no bitterness and considers himself as a "thankful survivor." Gene Brick considered himself to be an agnostic while aboard Drexler, but he turned to God quickly for help when swimming with burning oil around him. When asked about what he felt about kamikazes during the war, he said, "We thought they were crazy and brainwashed." However, he did not hold anything against the Japanese when he returned to the States, since he considered that the Japanese military leaders had a stranglehold on information provided to the Japanese people. Gene remained curious for many decades about who hit Drexler off Okinawa. In the late 90s, he watched a kamikaze documentary on the History Channel. He really became interested when a short segment in the documentary mentioned that Hajime Fujii, whose wife committed suicide along with their two children, died in a kamikaze attack on May 28, 1945, the same day Drexler got hit. Gene tried for several years to get more information to tie Fujii to Drexler's sinking. When Gene contacted me in the summer of 2005, we worked together to conclude that two planes from Fujii's squadron almost certainly were the ones to crash into Drexler (see Who Sank the Destroyer Drexler? for details). Joe Haas, former Fireman in Drexler's forward fireroom, and Robert Hunt, Fire Controlman, talked next with Risa Morimoto. Both men never told their families about the details of their wartime experiences and Drexler's sinking. They agreed that there is no relationship to modern-day suicide terrorists and kamikaze pilots who died in the war. Joe explained, "Terrorists don't care if they kill civilians, who have nothing to do with the conflict." Risa started at 8 p.m. on her final interview with Duke Payne, Gunner's Mate on one of Drexler's quad 40-mm gun mounts, and Fred Mitchell, radar operator, but I missed these two survivors' comments since I was getting hungry for dinner. On Saturday afternoon, I had separate interviews with both Fred and Duke about Drexler's sinking and their experiences afterward. Fred talked for almost three hours about the traumatic event and its effects on his life, so I will wait to tell his moving story in a separate article. Duke, who joined the Navy at 17 years old, served on the 11-man crew of Drexler's quad 40-mm gun mount on the starboard side. The first kamikaze plane to strike the destroyer came "right down the sights" of his gun just a few feet off the water. Despite "shooting that plane to pieces" and "knocking the living hell out of it," it crashed next to his gun mount and blew up the ammunition magazine. Duke has little memory of the few minutes between the crashes by the fist and second kamikaze planes. He had a concussion with shrapnel embedded in his face and back. He could not see for a short time after the explosion, but he discovered quickly that this temporary blindness was only the result of the setting on his goggles being switched to black during the blast. Although still in shock, he revived in time to jump into the water as the ship was sinking. He dove two or three feet under the surface to swim away from the burning oil on the water. He did not have a life jacket when he went overboard, but he swam in the water for about an hour and a half until picked up by a support ship. Except for Duke, all 11 men on his gun mount crew perished. A Memphis newspaper published an article about the Drexler's sinking about a week later, and many people thought that all hands had been lost since the ship went down so quickly. Duke's wife and his parents worried greatly about what had happened to him since they had no news other than this article, but finally a letter sent by Duke from Pearl Harbor arrived with the news that he had survived the attack and sinking. In 1985, he cried when he received a notice in the mail for the first reunion of Drexler survivors to be held in Charleston, South Carolina. Fred Mitchell, who served as radioman for Duke's gun mount, had always believed since the Drexler's sinking that nobody from that gun mount had survived. Fred came to his first reunion of Drexler survivors in 1987 at San Diego, and he was amazed to find Duke still alive. During the interview, Duke explained that he thought the kamikazes were dedicated, patriotic young men who went into battle to protect their families. He said, "If we had been on the losing part of World War II, we had people who would have done the same thing." On Sunday morning, the 2006 reunion attendees left Virginia City with a feeling of relief that the Drexler Survivors Reunion Association had survived. The Drexler survivors, most now in their early 80s, could now watch as a younger generation took responsibility for leadership of the organization. Everyone looked forward to seeing each other again at the 22nd annual reunion next year in Philadelphia.